If anyone in your family has a nut allergy, you are well aware that bakeries are a difficult place to find anything safe to eat. The risk of cross contamination is high, so we have decided for our family it’s safest to avoid all bakeries. This takes away the convenience of running into BJ’s or your local grocery store to order a birthday cake. We are fortunate to have a few nut-free bakery options around but, they are pricey and with three kids in tow not all that convenient. I first became interested in baking and decorating cakes two years ago for my nieces birthday party our usual amazingly talented nut free cake lady was booked solid. My sister and I decided to try and make the Frozen themed cake ourselves. We knew we could bake a cake but, decorating a cake that met the high standard of my soon to be seven-year-old niece who always watched cake decorating videos on you tube was a different story. We started first with making our own fondant, and then I created some Olaf characters out of the marshmallow fondant. A bunch of the Olaf characters turned out rather scary, a few came out decent. Fondant Olaf was fun, but I wasn’t ready to showcase my lack of fondant skills to a party of thirty to forty people. I then tried to do a buttercream transfer and, it went pretty well. After a few practice rounds, I started getting the hang of it. Creating the perfect cake for my niece was enjoyable, and I have been hooked since. My very first cake was for Layla on her 7th birthday two years ago It was an Olaf buttercream transfer. Lilly’s 8th birthday I made a Merida cake. *Please excuse the mess behind this cake, at the time I wasn’t planning on sharing it with everyone :)! This year, her order, was chocolate princess rainbow poop emoji cake, all fondant and no buttercream icing (she gave me strict rules). Layla allowed me to do a thin crumb coat under the fondant that’s it for the frosting. Since Layla doesn’t like buttercream frosting I tried a new “magic” frosting that only includes three ingredients. butter, chocolate chips, and marshmallow fluff. 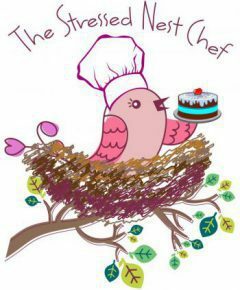 Two years later we are still making and decorating nut free cakes for friends and family, and I still enjoy it so much I decided to dedicate the stressed nest chef to share some of our families favorite allergy friendly foods. Previous postHappy belated Valentine’s Day!